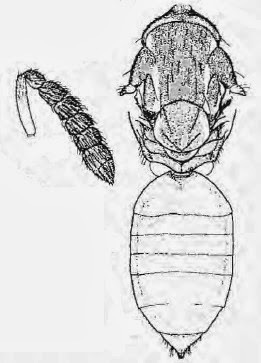 Female antenna, thorax and gaster of Eulophinusia cydippe, from Bouček (1988). Eulophinusia is a genus of parasitic wasps found in Australia; where known, hosts are small moths. Characters (from Bouček 1988): Body length up to 1.5 mm, dorsal thorax and face often with yellow pattern; antennae in both sexes simple, short, flagellum not distinctly clavate, funicular segments 2 to 4 transverse; notauli incomplete; scutellum without sublateral grooves, bare except for 4 setae, often broader than long, axillae wide apart, narrow and strongly advanced; gaster dorsally collapsing.